Summer Begins With 350 Ocean Fever Spins Pack! Another summer is just around the corner- and not just any summer, it's looking like a hot one that's bound to get hotter with Mr. Sloto's winning chances! Beat the heat with a 350 Ocean Fever Spins Pack! Summer brings a seasonal shift and also a change in your winning pattern that gets started when you deposit as little as $25! 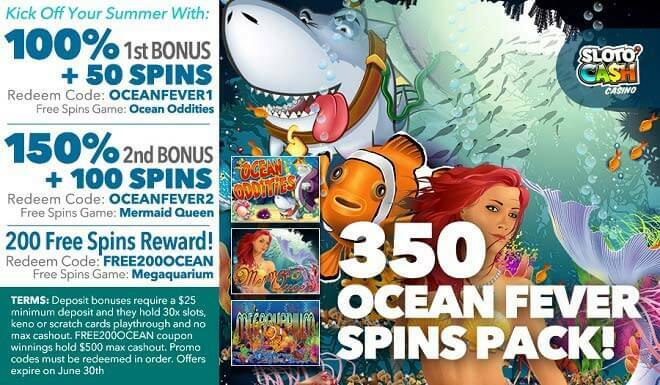 Move into summer with wins with a 1st 100% Bonus + 50 Ocean Oddities Spins, continue on to a 2nd 150% Bonus and 100 Mermaid Queen Spins and cool off with a 200 Free Megaquarium Spins Reward! The temperatures are rising, days are getting longer and wins are growing with Mr. Sloto's Welcome Summer 350 Ocean Fever Spins Pack!